The soft industrial style involves toning down the harshness of the modern industrial look to create a warmer, more inviting space. 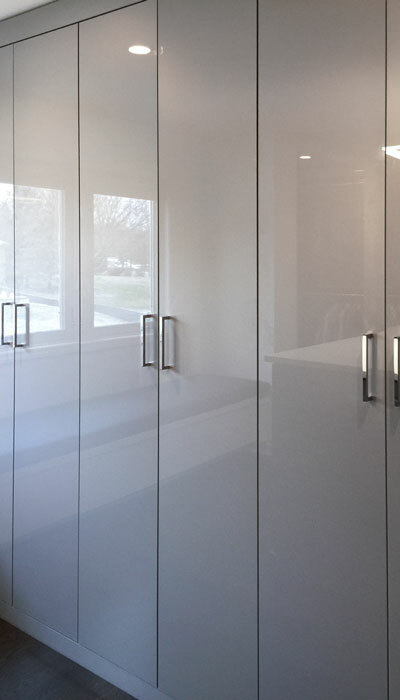 Warmth was injected into this industrial walk-in custom closet storage systems through the selection of a high gloss metallic laminate rather than true metal surfaces. The surface retains it's masculine feel without the cold, impersonal feel of true metal — for those seeking the shock value of a stylish and modern look, high gloss always hits the spot. The hip, urban flair of Metallic Silver offers a contemporary aesthetic that alludes to the thrill of high fashion, while still remaining classy and coy. A solid surface countertop in white further adds to the contemporary feeling, as do the oversize chrome handles used on the cabinets and drawers. Unusual features of the closet include the extra deep drawer units on one side of the closet island, requested by the owner. One of the benefits of going custom is that the storage is uniquely designed for the individual's storage needs. 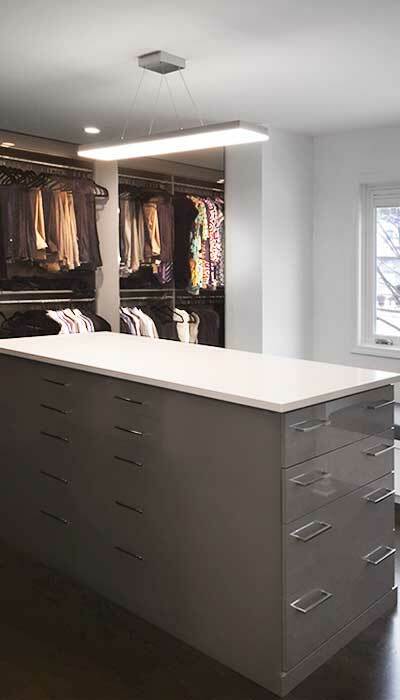 This custom master closet has an expansive closet island, elongated locker style cabinets, and various double hang clothing sections, all outfitted in the same high gloss silver tone laminate to meet the owner's uncommon style and wardrobe needs. Closet island with extra deep custom drawers on the ends suit the owners storage needs. 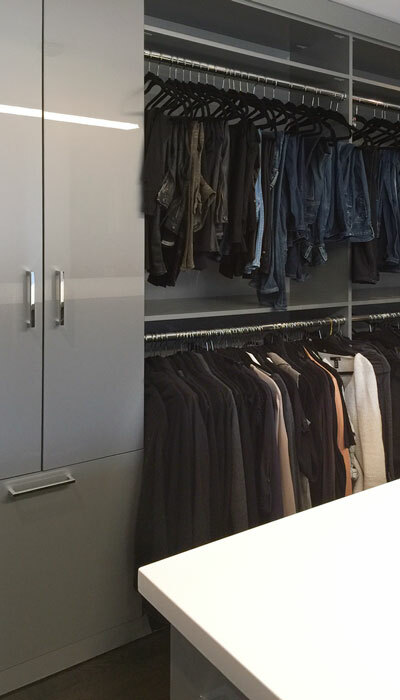 Custom closet storage systems with a masculine, soft industrial decor. Locker style wardrobe cabinets for a soft industrial vibe.